A mainstay on Five Favorites, DiegoFPV does a great job mixing various flying styles to create some of the most entertaining drone content on YouTube. If you are into distance FPV flying, Diego’s channel is filled with incredible long range feats and adventures. We recently had a chance to ask Diego some questions. If you are interested in learning more about long range flying, Diego put together some great responses. What’s your current go to quad setup? For long range, I really like the iFlight frames (xl6, xl7). I’ve been using the DYSF4 stack (Pro v2 FC, 30A 4-in-1). I’ve had good luck with the Emax 2306 2400kv motors for 6″ and LS2207 1900kv for 7″. My favorite FPV camera is the Runcam Swift Micro with a 3d printed mount, I almost never use the stock mounts that come with the frames. For receiver I use the Crossfire micro v2 set to CRSF with Immortal T antennas. You’ve done a lot of long range stuff, freestyle edits, and so forth at a variety of locations. How do you plan on what to bring when traveling? Does it depend on the flight plan, or do you just bring everything? If I drive I do bring everything. For trips constrained by what I can carry on a plane, I usually stick to 5.8 video. I bring my goggles with a TrueRC x2 air and a Pagoda, and usually two or three of the same quad. If I had to fly tomorrow I’d pack three 6″ quads along with an assortment of batteries from 1500 mAh to 5200 (all 4S) to have options regarding distances. I don’t go anywhere without my small ISDT SC-608 charger and a 100W power supply from an old laptop. What do you look for in a flying location? Do you plan your routes before you fly them (for example, using tools like Google Maps)? Do you try to plan the flight so that you’re always within LoS of the quad or have you had any success flying over the horizon? If I want to fly far, I do a fair amount of planning. Generally I see an area that looks interesting. If I have my gear with me and feel like exploring, I do pop out my laptop and explore the area on Google Maps. Flying over water is easier because there’s no risk of landing on people or property, so that’s what I do the most. It’s risky of course, but I’m OK with that. In the rare cases that I fly over land (for example in the Tahoe Mountains) I try to avoid private property and roads. I try to see if there’s a way to get to the quad if it goes down, but that doesn’t stop me from flying. If I know the quad would be irretrievable if something goes wrong, I decide to commit and just go for it. I like to stay as low as possible, which means I watch my RSSI and link quality all the time and only go up when I need to. I’ve been able to stay pretty low up to two miles out with Crossfire at high power and 1.3 video, to get as far as 4 miles I need to climb a bit. A good trick is to take off from a hill and go down, in the San Francisco Bay Area we have some islands and cliffs that make for great long range take-off spots. You’ve made a ton of edits flying at Treasure Island and other parts of northern California, any other favorite spots we haven’t seen yet? I love Lake Tahoe, I plan to do more flying there in the summer. I’ve only scratched the surface of what you can do there in terms of long range. The Northern California coast also has unlimited potential for long range, I’ve flown there some (mostly Marin Country) but never had the time to plan a good mission. I’m currently building a wing to explore the area a bit more. The footage won’t be great but I’ll learn more about interesting places to bring my quads. In addition to his long range exploits, DiegoFPV puts together some incredible freestyle. 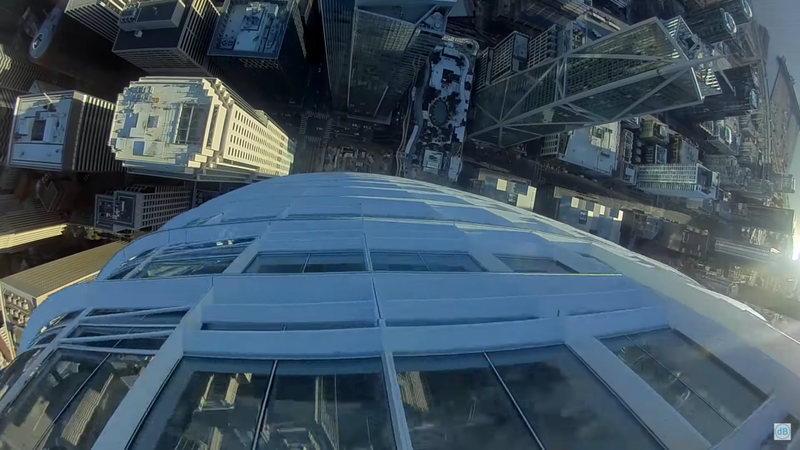 Long range flying seems to be getting more and more popular across drone YouTube channels. 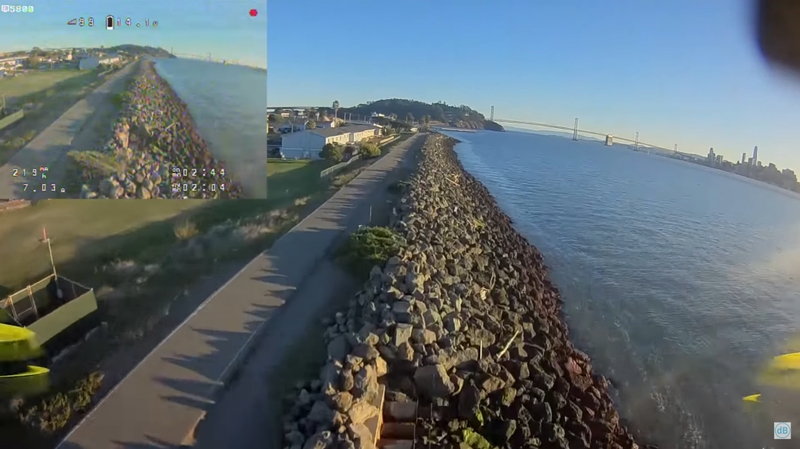 Your long-range videos have been incredible to watch (San Francisco Bay crossing, 3 Mile Loop, etc.). Any tips for those wanting to get started with long distance FPV? First and foremost, GPS and DVR are a must. Knowing that if your quad goes down you’ll know exactly where to go gives you confidence to explore. I’m also a huge fan of the Tile Sport, it’s saved me more times than I can remember. In general, having redundant ways to locate your quad is fundamental. I’ve had my DVR fail (“card error”) and still been able to find a quad in tall brush because of the Tile and/or Taranis GPS logs. Secondly, long range is an incremental pursuit. Set reasonable goals (“I want to go a mile and back with this quad”). You will usually find a limiting factor, it could be radio, video or battery. Improve whatever fell short, go back. That’s how I found out that 5.8 wouldn’t let me go as far as I wanted to here in the Bay Area and moved to 1.3, but that’s not the case in other low-noise environments. I’d say don’t go out and buy gear before knowing the limits of what you currently have. It’s all about exploring and pushing your limits while minimizing risk of loss. Diego puts together some great commentaries on his long range videos. Also very important, check your quad before a flight. Pilot error is always possible, but you can greatly mitigate the risk of mechanical failures if you’re confident in your gear before takeoff. I could go on and on, but I don’t want to spoil the fun of learning all the tricks of the trade through experience 🙂 When in doubt, there are many friendly people ready to share their hard-won knowledge. Long Range Hooligans on Facebook is a good resource, as is #longrange on the FPVChat slack. How many quads have you lost in your long-range exploits? Have any fun stories about retrieves? I drove 11 miles to find the quad still powered on, blheli beacon beeping, intact except for props! What kind of batteries do you use in long range flights? We generally see 3-5 minutes of flight time on our 1300mAh 4 cells, which would certainly limit range a bit. Ever thought of going to larger (6″, etc.) quads so you can carry bigger batteries? 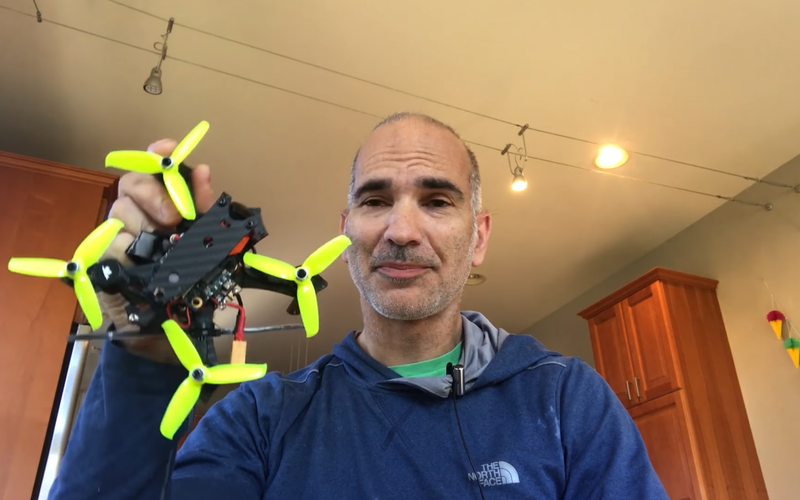 I do fly larger batteries with 6″ and 7″. I love 2300 4S Tattu packs for flights of up to 4 or even 5 miles (round trip). The biggest pack I’ve used is a 5200 4S, to fly to Treasure Island and back from Berkeley (about 7.5 miles round trip). I started to experiment with Li-Ion packs made of 18650 cells. I flew a 3-inch for 12 minutes on two of those, and I have a 4S2P pack (6 Ah) that I haven’t flown yet. It’s lighter than the 5200 mAh 4S so I expect to be able to do more than 4 miles each way. If that works well I’ll try 4S3P (9Ah) probably on a 7″ and see how far I can go! How far are you willing to fly before you start getting nervous? Do you rely on RSSI or video feed stability or something else to tell you when you are at your limits? What’s your personal longest FPV flight? Longest on a miniquad was 4 miles and back. I usually get nervous before the flight, but once I’m in the air I’m committed. I’m used to flying with very questionable video as long as it degrades steadily, when I get one short brownout in the middle of perfect video I usually turn around. RSSI is generally not a problem with Crossfire. You’ve mentioned on your site that you use CrossFire for your control link – I’d love to hear about your video link set-up. What VTX frequency do you use? Output power? Antennas on both RX and TX side? Do you have a crazy multi-diversity link like the Quanum overlord or just something strapped to your goggles? For long range I mostly use 1.3G video. So far my favorite receiver antenna is the 1.3 Pepperbox. It’s huge, so it goes on a tripod along with the receiver Diversity is not that important when flying in a specific direction, staying within the beam of the antenna is what matters most. On the quad, typically 250mw to 800mw transmitters (Fatshark 250mw, Fox 400 or 800). Power is not as important as having a very clean signal (good regulators / filters). The best antenna I’ve tried so far is the 1.3 TrueRC Singularity. One thing in your bag that you use all the time that everyone should own but might not? 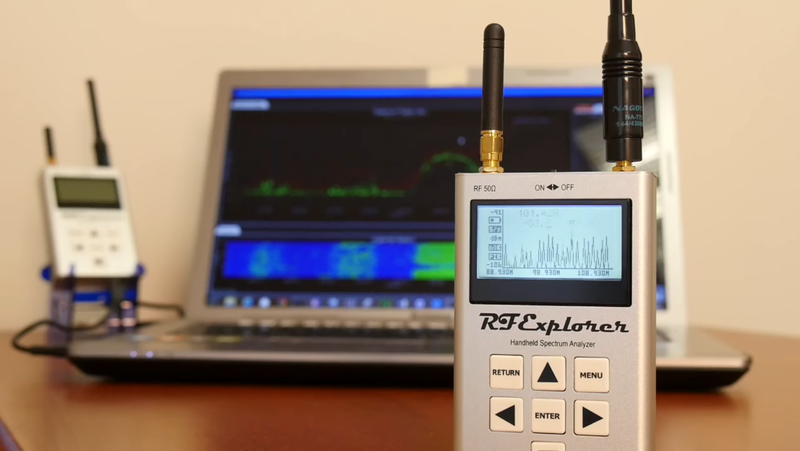 The RF Explorer. Where I fly, knowing the environmental noise conditions is fundamental. If you want to know how well a certain frequency will perform (e.g. 1.3 vs 2.4 vs 5.8), it’s an invaluable tool. It’s not cheap, but work every penny to me. Are you looking forward to anything you see coming soon to the hobby (gear, parts, tech, etc.)? I would like to see some serious competition in the goggle space. Fatshark goggles are great, but you shouldn’t have to mod a $500 gadget just to have a power switch. Who’s your favorite pilot to watch right now? I still enjoy Gapit’s videos because they are entertaining and well made. I watch Steele once in a while, not so much for the flying these days but because he makes a genuine effort to put out interesting content. I also watch long range flights from fellow “Long Range Hooligans” Matt Bardeen, Mike Stevens and others. Other than your DiegoFPV YouTube page and site, where can we find you? Diegofpv.com is my blog where I post rare updates on the things I’m working on (for example GPS Rescue for Betaflight), I’m on Instagram as fpvdiego! Thanks Diego for sharing some of your knowledge on long range flight! Definitely head over and subscribe to Diego’s YouTube channel and check out his website.